Blindspot exists in that odd limbo, where it’s not a great show, but it’s not a bad one either. Since its premiere Blindspot’s had an overall exciting premise with some fantastic actors in the lead roles—and yet it’s not a satisfying series. We’re finally getting some payoffs—things that we’ve been dying to see since this past fall, but now it just doesn’t seem worth it. 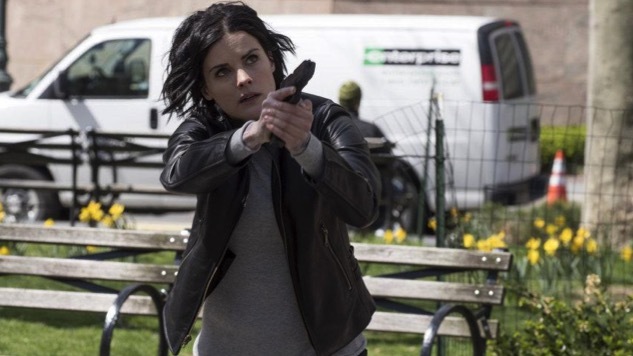 Blindspot will be coming back for a second season, even though its ratings and viewership has steadily declined over the months. But, after all these subpar episodes, is anyone really going to come back to watch next season? There’s only one more episode left to the season, and as of now I am not convinced that I’ll be tuning in this coming fall. Here are the five most ridiculous moments from last night’s episode. 1. Sophia is Alive and Well (Again)... and Part of Oscar’s Team! It was an interesting reveal, but also a reveal straight out of a soap opera. Not once, but twice have we now been under the impression that Sophia was dead, yet here she is (again)! And not only is she still alive, but she works for Oscar! Through a flashback we learn that Jane herself recruited Sophia to join their cause against the FBI (which we still really know nothing about). Apparently Sophia felt compelled to join when Jane told her, “This is your chance to buy back your soul.” Melodramatic much? And after that reveal we never see Sophia again for the rest of the episode, as though her only purpose in this show is to surprise characters with the fact that she’s alive. That guy got riddled with bullets from a faraway rooftop, with the FBI team standing right in front of him! And yet they were completely unharmed. Somehow the sniper’s barrage of bullets whizzed right past Jane, Kurt, Zapata and Edgar and hit the male nurse directly in his chest. Sure, it could be argued that the sniper had a good angle over them, but still, that was one ridiculously accurate sniper. It’s great Kurt got promoted, but he got the promotion from the visiting FBI boss directly after he told him off. Kurt got all dramatic, defending his team investigating the tattoo case when they were told not to, by arguing about trusting his gut over everything else. I almost half-expected him to shout, “I may be a loose cannon, but damn it, I get results!” And the FBI guy’s response was basically, “Yup, and that’s why you’re the new boss—but you still need to stop this whole Jane Doe thing.” Kurt seemed offended, not just that he was told to file away all the Jane Doe cases, but by the fact that he was promoted. It was an awkward scene. All this time, did we ever learn Kurt’s father’s name? I don’t think so, and now we probably never will, because he’s dead. And in a way, that was not really the biggest shock—Kurt’s dad passed away on a rather dramatic note by admitting he did kill Taylor Shaw. Say what now?! Quite the twist, but not a well set up one. The show’s been playing the whole did he/didn’t he card throughout most of the season, until a few weeks ago when it was seemingly revealed he was innocent of any wrongdoing. Now he suddenly admits—on his death bed—that he was indeed the killer. There’d be no reason for him to make this up at that moment, so it’s likely safe to assume Taylor Shaw is really dead, and now we’re back to square one, concerning Jane Doe’s identity. Although, who knows, I wouldn’t put it past Blindspot at this point to somehow make it so that Jane Doe might actually still be Taylor Shaw and Kurt’s father was just going crazy right before he died. There was a lot of death in this episode. Mayfair’s death was actually kind of an exciting moment, in that it’s now put Jane at a point of no return. If the FBI team were to ever find this out, she would never be forgiven for this. Mayfair suddenly got kind of irrational when she confronted Jane. Of course it makes sense that she was upset at Jane for setting her up, but if Oscar hadn’t killed her, Mayfair would have ended Jane right then and there. And she almost tries to, even after she was shot, but Jane deflects it and Mayfair dies with complete resentment toward Jane. And that’s too bad, because Jane was willing to stay with her and try to heal the wound. It seemed kind of odd that Mayfair wouldn’t have been a little sadder in that moment, perhaps having a softer farewell with Jane, but no, Mayfair dies seething with pure hatred. And by the way, what was up with Oscar in this scene? He just comes into the room, shoots Mayfair, and then immediately leaves as Jane cries over her responsibility of Mayfair’s demise. That’s not going to help him remain on Jane’s good side—and he’s already on thin ice with her.